Heat grill to high heat; lightly oil grates. In a small bowl, stir together coriander, 1 tsp. sea salt, and ½ tsp. pepper. Rub salmon with oil; coat with coriander mixture. Grill salmon to desired doneness approximately 2 minutes; flip and continue to cook for another 3 minutes. Meanwhile, to make the cherry salsa combine cherries, onion, cilantro, jalapeno, honey, lime juice, lime zest, blackberries, almonds, remaining sea salt and pepper in a medium sized bowl; toss to combine. Place in the refrigerator until ready to serve. Remove salmon from grill; transfer to a serving plate. 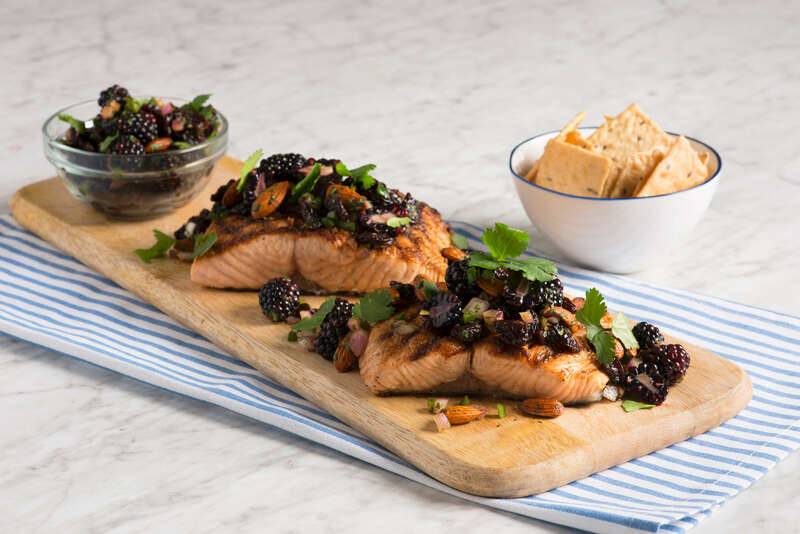 Serve with cherry salsa; garnish with additional blackberries and almonds.